Make managing your Contacts Effortless! Contact Wolf can import Data when it is in the standard comma separated value format (.csv) . (Also known as comma delimited format) Sometimes these types of files have different name extensions (.cdf, .txt, .csv ). The file name extension is not important as long as its a text file that has each data field separated with a comma. The first line of this exported text file MUST have the data field names on the FIRST line so that Contact Wolf can match the imported data fields to its own data fields. After the matching/mapping process is finished each record is imported and added to the Contact Wolf database. 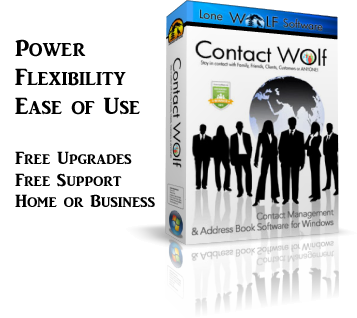 The Contact Wolf import engine can also import data in this format. Most database software programs can export comma separated text files. 3) In the Contact Wolf Import Window select either the Personal or Business directory to import the records into. NOTE: If you are importing the data into the PERSONAL Directory each record must have a LAST NAME or it will be skipped. If you are importing the data into the BUSINESS Directory each record must have a COMPANY NAME or it will be skipped. 4) Click in the Imported Field list on each Data field being imported (under Imported Field column) to select it. 5) Click on the Drop Down Menu button (Down arrow) to select the matching Contact Wolf Data Field to map to the data field being imported. 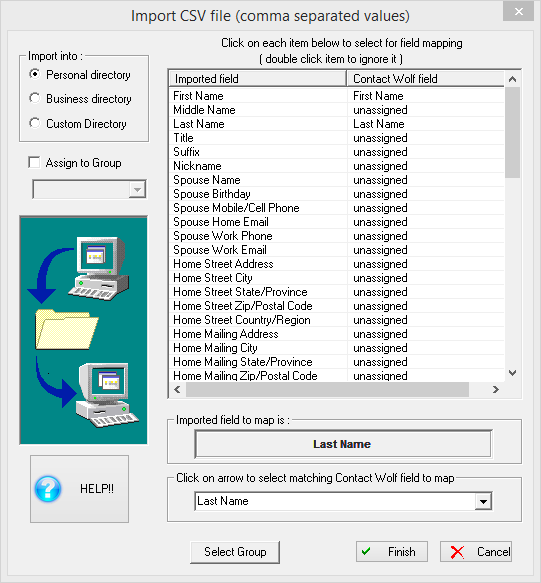 Continue the mapping process for each data field until All fields have been mapped successfully. TIP: To skip or ignore an imported data field simply double click on it in the List displayed. TIP: If you cannot find an appropriate matching data field in Contact Wolf to match to an imported data field simply select the Contact Wolf Data Field named COMMENTS. This data field can be mapped to MULTIPLE Data Fields. Each data field mapped to it will appear on a separate line in the COMMENTS box after the data has been successfully imported. 6) Click the Finish button to import all the records from the exported file. TIP: Contact Wolf currently limits the records being imported into the Contact Wolf database to 1000 per import attempt. If the exported file contains more than 1000 records to import you will see a message displayed in Contact Wolf giving you the option to import the first 1000 records. Answer YES to import the first 1000 records. After the import has finished you can open your exported data file in Notepad and edit the file manually to split it into separate files that each contain less than 1000 records (separate lines) in each file. Then you can import the remaining data by importing any files that were created in Notepad. Make sure to add the FIRST LINE of Data Field Labels in the original file to the new files to be imported to allow mapping of the data fields.